Chocolate milk is not only delicious, but a healthy for most children. Whether it’s plain or flavored, this drink has the same essential nutrients. Vitamin D, calcium, and potassium are just a few of the important nutrients milk contains that kids need as a part of a healthy diet. Here are three reasons why chocolate milk is a great choice for students. This drink meets your child’s daily values of vitamin A, potassium, calcium, and magnesium much quicker than a milk-free diet. Three servings of fat free or low fat dairy products are recommended for children every day by the Dietary Guidelines for Americans. While children who do not drink milk and those who do have about the same comparable body weight, those who do consume more nutrients. Those who drink flavored milk are also less likely to drink empty calorie beverages such as juice or soda. If chocolate milk is offered as a choice at school, children are more likely to get their three recommended daily servings of dairy. The most popular option for kids is low fat chocolate milk, when given a choice between plain or flavored. A dramatic drop in the consumption of this beverage has been shown when flavored options are removed from schools. This makes it more difficult for children to get the essential nutrients they need. There is minimal added sugar in flavored milk. Some people believe that offering chocolate milk at school will contribute to children having a higher daily intake of added sugars, but this isn’t completely true. Studies show that only three percent of added sugar in a kid’s diet comes from flavored options. Schools and dairy companies have worked together to reduce the amount of sugar in this drink by 38 percent. Nearly all chocolate milk served in school is less than 150 calories for one 8-ounce serving. Flavored options have only 31 calories more than white. Chocolate milk served in schools has only 8-12 grams of sugar added, and 12 grams of naturally occurring sugar, or lactose. 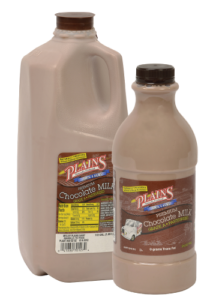 Plains Dairy provides a large selection of high quality Milk and Cultured products, as well as Non-Dairy products. Call us today at (806) 374-0385 or Contact Us by email to learn more About Us. You can also Find a Location near you and view our Recipes!